Five year old Sweet Pea and I are still reviewing the alphabet in various ways throughout the week. Letter R was especially fun and lends itself to some experiments! I did, however, remember to include making rainbow milk again! So. Much. Fun. for my kiddos every time we make it! In the past, our letter R learning was centered around railroads and rainbows. We also did a very short Bible Story concerning the Rich and poor. This time for a letter R activity Sweet Pea and I tried to discover what does and doesn’t roll and what the objects have in common. This was a really simple experiment to throw together and was fun, so it’s a good one to keep in your ‘rainy day’ arsenal! Set up your experiment area – make a small ramp. We made ours by positioning wood blocks with one end on top of the other, creating a gradual slope. 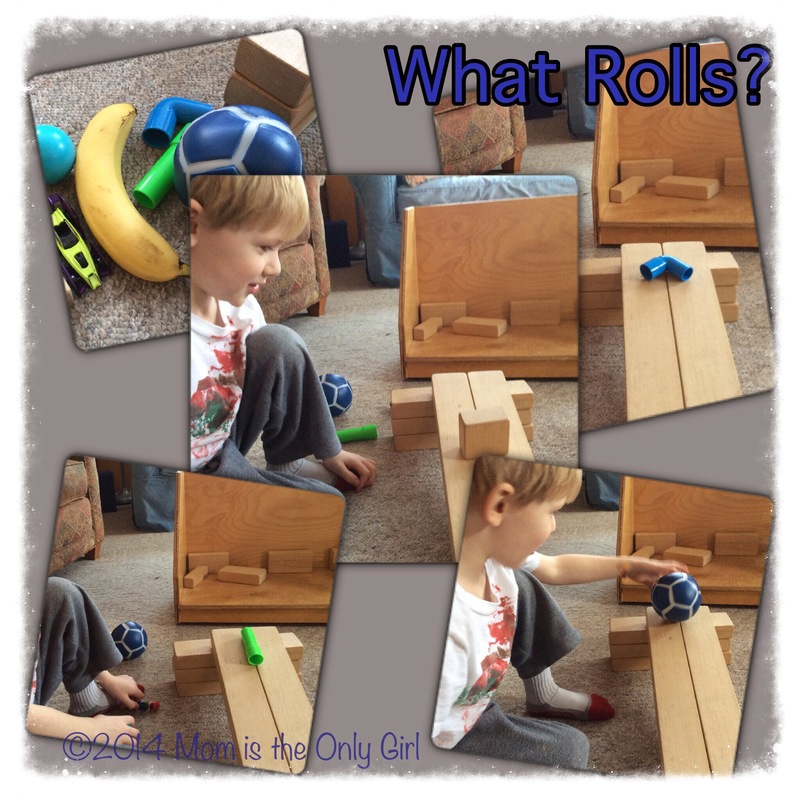 Pose the question – Will these objects roll down the ramp? Or create a hypothesis about the objects with your child. Then, have fun experimenting with the objects asking prompting questions during the play. Have discussions about why some objects roll and others don’t. Come up with a list of what each group has in common. After we discovered what rolled and tried to roll the objects that didn’t roll a few other ways, Sweet Pea selected toys to try, too! This was fun for us indoors on a small scale, but if you’d like to integrate gross motor into it, take it outdoors! Last fall we created a small, low ramp outdoors on our driveway with a 2 x 4 (with the 2″ being the height) and a piece of plywood. We tested our outdoor play toys, including rolling a scooter down the ramp (holding it with our hands, not riding it- that wouldn’t be safe!) a whiffle ball, a toy truck, a rock, a tennis racket, chalk, and a bike helmet. I say this was gross motor, because it required a little more walking and running to get the materials to test, which the boys were happy to do on their own, and to chase after them when they rolled away. I challenged them to try rolling the objects in different ways to see if they could roll if set on the ramp in a different manner.